' I just know got such a syntax, which really near to human language syntax "IsNot"
' and about ClientID property which is very useful in some case. 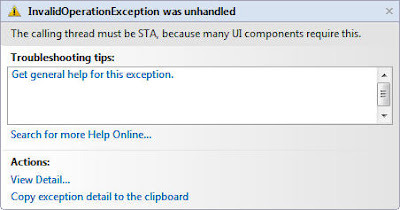 I was thinking what's wrong with this line and you will get this exception if you throw the exception out to the display only. Surfing around and I got the answer. We have to understand how response.write or server.transfer work! In ASP.NET, response.write and server.transfer will end the threading with response.end. Thus, if we have a TRY...CATCH...END TRY within it, the TRY Thread will be aborted and ended suddenly and the exception will be caught. We should make the response.redirect before or outside the catch at this point. Usually, we will have a checking for session lost at the beginning of the page. This simple validation portion might not need to be inside Try Catch loop and you will be safe! In addition, sometimes programming like to declare variable inside Try Catch loop too, and it is NOT necessary to do so. I did a XBAP Demo in my company sharing session, and wish to see more interactive and creative design with Microsoft WPF , .net 3.0 Framework. Wooow, just surf around for free datagrid in WPF, I got this Xceed. Doesn't it look pro ? 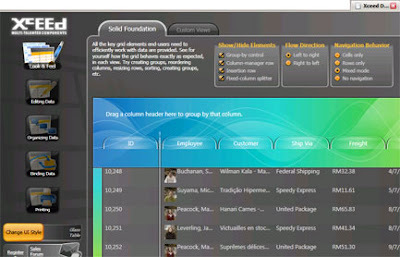 I am not Xceed stuff, anyway feel amazed with the little visual effects and design in this rich media web application. Take a look! Wish to explore it more and hope I can apply my macromedia flash skill into this WPF too! You have to get your Google API Key first! There are times in your scripts when you are going to want to get the current page URL that is shown the browser URL window. For example maybe a page URL has Querystring info appended to it and you need to send an email off to someone with that same exact URL and Querystring information. There are plenty of other reasons as well. Here is some code to do it. Lets say the current page is simply "http://www.mysite,com/view_user.asp"
Now, if your page has Querystring info and variables you want as well. you would use code like this. If your page had Form info that might have been posted to it you would use code like this. If your page had both Querystring and Form info you could try code like this. My.Application.Info.DirectoryPath & "\Reports\" & "myReport.rdlc"
Where myReport.rdlc is located under Reports folder in my win app program. 1. add in a list. Do you ever compile with command line ? Just recall back Java Learning during university lab. From the Start menu, click on the Accessories folder, and then open the Windows Command Prompt. At the command line, type vbc.exe /imports:Microsoft.VisualBasic,System sourceFileName and then press ENTER. For example, if you stored your source code in a directory called SourceFiles, you would open the Command Prompt and type cd SourceFiles to change to that directory. If the directory contained a source file named Source.vb, you could compile it by typing vbc.exe /imports:Microsoft.VisualBasic,System Source.vb. You can store as many of these elements as you want, read them out at runtime, and use the values in the application. If you have an item that contains multiple values and you would like to keep them together, you can store them as a single string, delimited with a pipe | or other symbol, read them out at runtime, and call the String.Split() method to parse them into a useable string array.